DML has now released a “new” kit of a late-war M4A3 Sherman with the T23 turret and 76mm gun, and while they dub it a “Premium” kit suffice it to say it may disappoint some as it does not come with a plethora of etched brass, pre-bent wire, interior parts or even a turned aluminum gun barrel. However, DML has taken the best of their late-release Sherman kit sprues and tweaked them once more, adding a lovely set of DS plastic T48 tracks with extended end connectors to boot. Personally, I do wish they had provided two sets as they did with their recent M4A2 kits (e.g. with and without) as many modelers have asked for nicely done one-piece T48 tracks. But these are nicely done and will make most modelers quite happy. The DS plastic has proven to be easy to deal with, hold great detail, and also is more amenable to painting than vinyl. It also solves the one bugaboo most modelers have with DML kits, namely the three-piece single link VVSS tracks. This kit comes with the latest versions of the hull with raised weld bead detail, a choice of early or late T23 style turrets (e.g. either split hatch or oval hatch for the loader), three different gun barrels (M1, M1A1 or M1A1C), two different bogie styles (either “straight top” return roller mounts with pillow blocks or “upswept” return roller mounts), five-spoke welded steel wheels or pressed steel welded wheels, either “sculpted” or flat driver toothed rings, an early model exhaust diffuser, both .50 caliber and .30 caliber turret machine guns, and the aforementioned T48 tracks with extended end connectors. Some of the sprues show different parts counts indicating some new “tweaks” to them have been introduced, and the overall effect is quite impressive. There are only 19 brass parts, most of which cover the skirt attachment brackets and the front fenders. Due to improved molding techniques, DML has only included injected periscope guards, which may not stand well with some modelers but others are more than content to live with as they are less prone to going “airborne” when the model is completed. Technical consultant is listed as Pawel Krupowicz, a name familiar to anyone on the “Missing Lynx” armor modeling website. Five different finishing options are provided: 37th Tank Battalion, 4th Armored Division, Bastogne 1944 (olive drab, “Thunderbolt VI”); 4th Tank Battalion, 1st Armored Division, St. Lucia, Italy 1944 (olive drab, “Somme IV” - red 2); 760th Tank Battalion, 5th Army, Italy 1945 (olive drab, “Kokomo”); 761st Tank Battalion, Task Force Rhine, Germany 1945 (olive drab and black camouflage, “Cool Studs Inc. #4”); and 714th Tank Battalion, 12th Armored Division, Germany 1945 (olive drab and black, 711). Overall this is a good idea and a popular choice, and while some modelers have groused about constant upgrades and changes DML is reacting to input and requests from modelers. 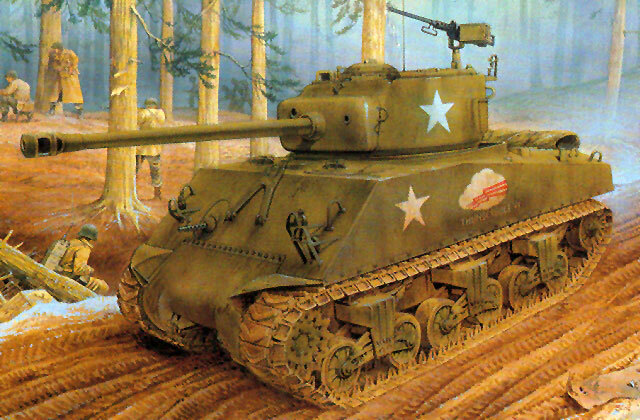 Note: for Shermaholics, here’s a listing of the Sherman kit sprues that I have seen go by over the last few years. I do not have the actual sprue identifier, but it shows what DML has done over the years to improve and correct their kits. Changes in parts numbers usually indicate revisions.